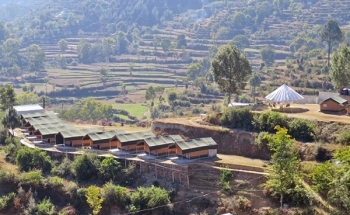 Camp Garuda is a perfect getaway camp for adventure and nature lovers in Pauri Garhwal. Encircled in green hills of pines, the camp offers a comfortable accommodations in cozy tents. The pleasing beauty of the place includes scenic landscape, terraced green fields and turbulent stream close to the camp site. With the first sunlight, start your day with refreshing air and get ready to explore the adventures nearby offered by the camp. The guests will surely like village walks to nearby villages Joshiana, Dungri, Kandara, Gaad ka Margaah etc and witness the charming rural lifestyle of the locals. Apart from that the camp also provides adventure activites such as Paragliding, trekking, rafting and mountain biking. The camp is located in Joshiana village near Parsundakhal market on NH 534 in Pauri-Kotdwar road. From Parsundakhal market, the camp is just 300 mtrs away. Pauri town is at a distance of 15 kms from the Parsundakhal. There are also many sighseeing places nearby Pauri such as Ransi Stadium, Kandoliya Temple, Danda Nagraja Temple, Jwalpa Devi Temple, Khirsu, etc. 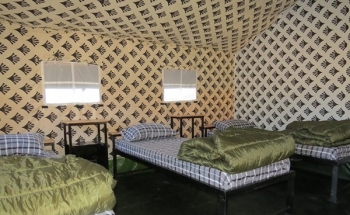 The camp offers deluxe swiss cottages and tented accommodations for a comfortable stay to guests. There are 10 Swiss Cottages and 7 Tents, each has beds with cozy quilts and attached luxurious bathrooms to ensure privacy, hygiene, and ease of use. The camp serves homely cooked food in a buffet. Organic and local vegetable, rice, wheat, fruits, milk and eggs are used to prepare meals. Railway Station : Kotdwara (92 kms) is the nearest railway station to reach Pauri. There is regular bus and taxi service from Kotdwara to Pauri. Airport : Jolly Grant Airport in Dehradun (143 kms) is the nearest airport to reach Pauri. One can hire taxi to Pauri from Airport or can take sharing taxi/ bus from Dehradun ISBT.